Since 1986 I have taught privately, both children and adults. In my practice I work to achieve a balance between solid rudimentary skills such as sight reading, technique, chord theory, and ear training; and more innovative approaches with an emphasis on creativity, including improvisation, composition and expression. I always seek to encourage in a student a relationship with their music that is inspired and expressively linked to their personal process. Lessons are taught in a relaxed environment, with a musical bent oriented towards popular styles such as blues, rock, new age, classical and jazz. Should a student wish to learn to play the Beatles, Coldplay, Thelonious Monk, J.S. Bach or Scott Joplin, I am ready to go! We learn about chords and how they work together in any given key, we develop the ability to play by ear, we improvise, compose, we learn how to accompany singing, we find our way towards creative self-expression through music. In addition to piano, I play and teach basic guitar and hand percussion. I have a fundamental understanding of most orchestra instruments as well as the voice and feel prepared to compose for and rehearse these members of the orchestra. I have also taught seminars on ensemble playing, music theory and appreciation, as well as synthesizer/MIDI programming and applications. I have 2 studios, one in Niwot and one in North Boulder! The Niwot studio is attached to my home, which is within walking distance to historic downtown Niwot. The North Boulder (near 28th & Iris) studio is at a great location close to bus routes and shopping. I would be delighted to meet with you in person for a free consultation or speak by phone. Please contact me today! • Piano lessons enhance school readiness, fine motor control, use of symbol systems, following directions, concentration, memory, perseverance, visual and aural discrimination, organizational skills, task completion, and goal setting. • Piano lessons encourage abstract thought and stimulate right-brain activities – synthesis, creativity, intuition, and innovation. 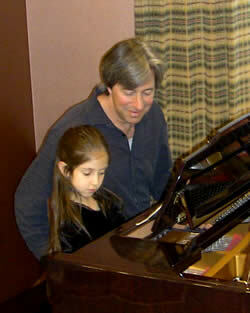 • Piano lessons develop attention span and concentration level. • Piano lessons build self-esteem and develop initiative. appreciation for the rich and vibrant music of the Middle East. is a Jewish musical tradition originating in the 'Shtetl' (villages) of Eastern Europe, later mixing elements of Arabic, Gypsy and Jazz music to its infectious sound.